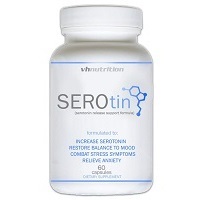 SeroTin from VH Nutrition is an anxiety and stress relief supplement formulated to boost serotonin. It is a highly potent natural stress relief and antidepressant supplement designed to aid in providing depression support and anxiety relief. SeroTin is meant to be used as a beta blocker support supplement. It is composed of natural herbs and remedies to help increase serotonin, restore balance to mood, combat stress symptoms and relieve anxiety. The ingredients in SeroTin, when this review was written, included: Licorice Root, Lavandula, Saint Johns Wort, Valerian Root, Melissa officinalis, Humulus. These ingredients made up the Serotin Proprietary Blend, of which there is 1495 mg per 2 capsule serving. Users of SeroTin are directed to take 2 capsules with 12 fluid ounces daily. In regard to its ingredients, lavandula (better known as lavender) may temporarily alleviate anxiety and may also increase slow-wave sleep patterns. Saint Johns wort may help to improve and regulate mood. Valerian root appears to act like a sedative on the brain and nervous system, helping to provide calm. Melissa officinals (also known as lemon balm) can act like a sedative and produce a calming effect. Humulus (also known as hops) may help to decrease anxiety and make you sleepy. Essentially, SeroTin contains several ingredients that can typically be found in over-the-counter sleep aids. Although this is not a studied or proven product for anxiety relief and/or depression support, there is a good chance that this formula may help you feel calm and possibly sleepy, based on its ingredients. However, simply because something might make you calm or sleepy does not mean it is a viable treatment for chronic anxiety or depression. What’s more, users of this product are cautioned to avoid drinking alcohol in excess while taking it and they should also avoid operating heavy machinery as it may cause drowsiness. SeroTin is not meant for children under the age of 18 and this product should not be used by pregnant or nursing women. Although the official product page for SeroTin says that it “may help cure depression and anxiety by acting as a serotonin booster supplement,” be advised that if you are suffering from ongoing depression or anxiety, these are very serious mental health conditions and you should talk with your doctor before choosing a treatment. This is important because it may be that you will need a treatment that is stronger or different than a simple – and unproven – over-the-counter dietary supplement.